This year’s Agile Open Belgium will again be held in beautiful Gent, on May 21st and 22nd. The Open Space format lets participants determine what’s on the program, how sessions are run and what they want out of the session. The conference location at IBBT provides several rooms, so that each session can run undisturbed by others while allowing participants to move easily from one session to another. I’m looking forward to return to Geneva to take part in the second Swiss XP Day. Last year’s event was a lot of fun. This year, I’ll co-present “Agile Project Management in practice” with Portia Tung and I’ll help Portia run the “Coaching with the Wizard of Oz” Agile Fairytale. Le coaching est simple, mais pas facile. Quelque soit votre rôle dans l’équipe, ces techniques seront utiles pour améliorer chaque jour. Apprenez quelques techniques de coaching et mettez-les en pratique. Les personnages du Magicien d’Oz vous aideront sur la longue route de brique jaune vers la cité d’Émeraude. A bientôt les amis Suisses et Français! Couldn’t come to XP Days Benelux 2009? You missed a lot of great sessions. Even if you did go to XP Days Benelux 2009, you missed several great sessions, because the program committee stupidly scheduled great sessions at the same time in each of the five parallel tracks. Or maybe you want to send your colleagues to those great sessions you attended. Well now you can, because 8 of your favourite sessions are being presented again at Mini XP Day Benelux on April 26th, 2010. Mini XP Days Benelux remains the place to exchange ideas and share experiences about Agile in an open and relaxed atmosphere. Register quickly because the event is limited to 60 participants and the event usually sells out. Juan Gutiérrez Plaza has contributed a Spanish translation of the Business Value Game. Thanks also to Leo Antolí and Thomas Wallet for reviewing this translation. Muchas Gracias! 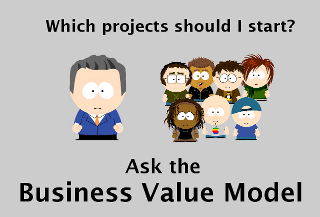 You can download the Business Value Game in English, French and Spanish from the Belgian XP site.